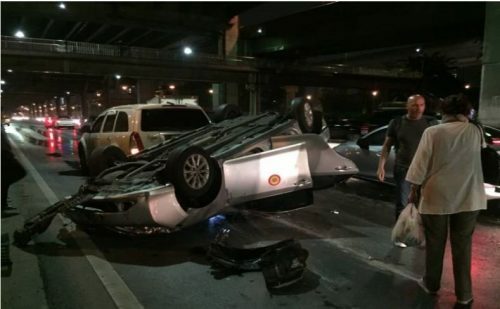 An Italian man and his wife were fortunate to escape serious injury after a limousine service they were using from Don Muang airport overturned on Viphavadee-Rangsit Road last night. Four vehicles were involved in the pile up – an Isuzu Mu-7, D-Max and Vigo pick-ups and the Toyota Camry limo. Pol Lt Pamon-ek Bunanan of Viphavadee police and the Poh Teck Tung rescue service attended the scene near the entrance to the tollway at Chang Wattana. They found the limo on its roof blocking two lanes. A man and a woman were taken to hospital with minor injuries. An Italian man declined hospital treatment. Limo driver Methee Ruamyart, 49, said he had picked up the foreign couple from Don Muang airport and was taking them to a hotel in Rama 9. It had been raining since evening, he said. Two vehicles ahead collided with each other and the barrier causing him to brake suddenly. He was then shunted from behind making his vehicle overturn. Police are studying CCTV to get to the bottom of who was responsible.